Take exit 25 (Arapaho Road). Stay on service road; cross Arapaho. Turn right into FUMCR driveway. DO NOT use exit 24 (Belt Line). There is not sufficient distance to cross lanes and enter our campus safely. Richardson Police will ticket drivers who cross the solid line in an attempt to enter the campus this way. Take exit 25 (Arapaho Road). Take U-turn under Central; stay on service road. Turn right into FUMCR driveway. Custer Road intersects Arapaho two blocks west of Central Expwy. Turn south onto Custer Road; go 0.2 miles. Turn left into FUMCR driveway. 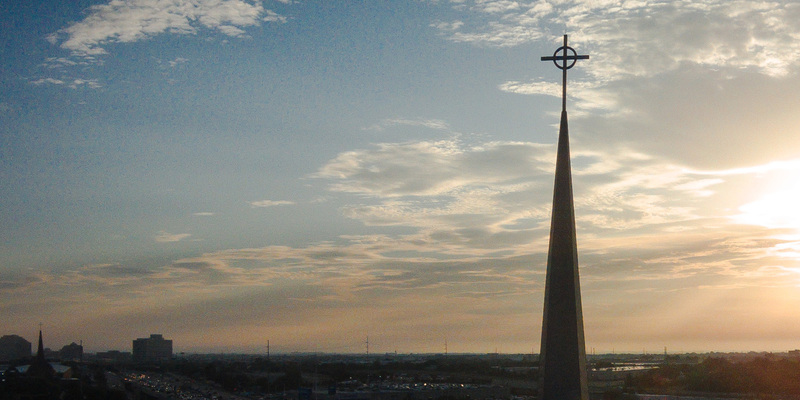 The church campus at 503 North Central Expressway and First Center at 515 Custer Road are one thousand feet south of Arapaho Road on Custer Road. Arapaho Road is DART Bus Route #361, however Bus 361 does not run on Sundays. Worshipers who want to use public transportation on Sundays can phone the church office at 972 235 8385 during the week to arrange to be picked up by the church van from the Arapaho Transit Center, which is .7 mile (3700 feet) from the church.